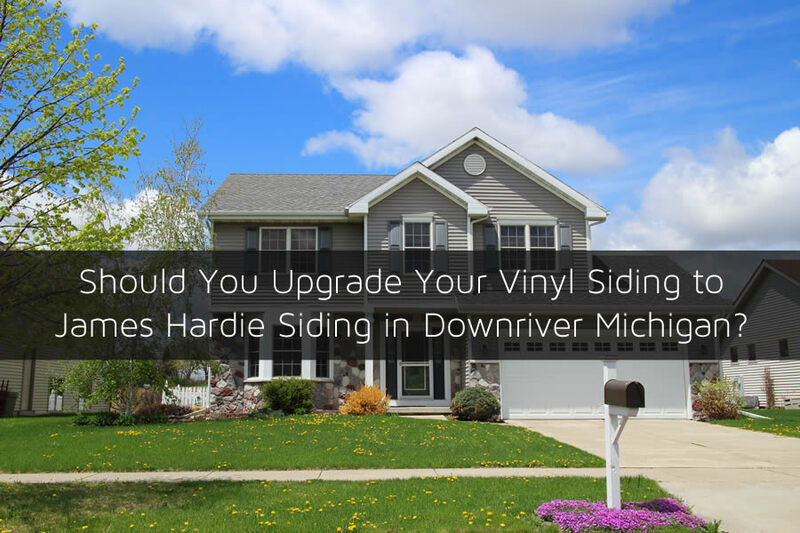 Should You Upgrade Your Vinyl Siding to James Hardie Siding in Downriver Michigan? Giving your home an upgrade in appearance will usually mean upgrading the siding. With so many different siding choices available today it can be a difficult choice. But there is one siding that seems to be much better in terms of durability and design that others and that is James Hardie Siding. If your home currently has vinyl siding installed there are many advantages of installing James Hardie siding on your home which I’ll go over in this article. One of the biggest benefits of vinyl siding and James Hardie siding is they have a very low maintenance requirements. Once they are installed the siding can last for years without any intervention from the home owner. One reason why it’s so popular is that it’s so low maintenance and looks absolutely amazing. And if your home currently has vinyl siding installed, it may be a good idea to upgrade your home’s siding to a more dependable siding which is James Hardie Siding. Although in terms of siding the type of siding known as James Hardie siding is relatively new, it has become very popular, very quickly. In fact, over the past few decades it has become one of the most popular siding choices for home owners. James Hardie siding is actually a fiber cement siding. It’s made by using fibers of cement woven together and cast into planks. The planks are made with the appearance of wood grain, smooth siding, and beaded siding. They also have other designs including vertical planks and full panels if needed. They are not vulnerable to wood rot, insect damage, or moisture damage. In fact, once installed they provide a very good barrier on your home. Much better than vinyl siding. If your home currently has vinyl siding installed you can upgrade to James Hardie siding in most cases without much added costs. Since vinyl siding and James Hardie siding is installed using a backer material it’s likely already in place whereas if you have some other type of siding it may need to be added. There are some problems that you may have with vinyl siding that you won’t have with James Hardie siding. One of the biggest problems for residents here in Downriver Michigan is the cold weather. As the temperature drops below freezing it causes the vinyl siding to become more brittle and easier to crack and break. Sometimes the slightest little bump can cause the vinyl siding to crack and once it cracks it can allow moisture behind it which can cause problems. Unlike vinyl siding James Hardie siding hold up very well even in the cold Michigan winters. In fact, once it’s installed it provides a layer of protection on your home that is only matched by siding products such as bricks or cement blocks. James Hardie siding is not affected by the cold weather at all even when the temperatures dip below freezing. If you currently have vinyl siding installed you may think that you’ll need all sorts of upgrades in order to have James Hardie siding installed but that may not be the case. James Hardie siding as well as vinyl siding both are installed on a backer material usually made of wood. If you currently have vinyl siding installed the installation of James Hardie siding will mean to remove the current vinyl siding and then installing the James Hardie siding on the wood backing. Much the same if you were re-installing vinyl siding. Of course, there are other considerations such as house wrap, insulation, and more. But in both cases of James Hardie siding and vinyl siding these are options that you’ll have as a home owner. If you’re ready to get started on your siding project or you just want to get more information on installing James Hardie siding on your Downriver Michigan home be sure to contact All Point Construction today at 734-407-7110. 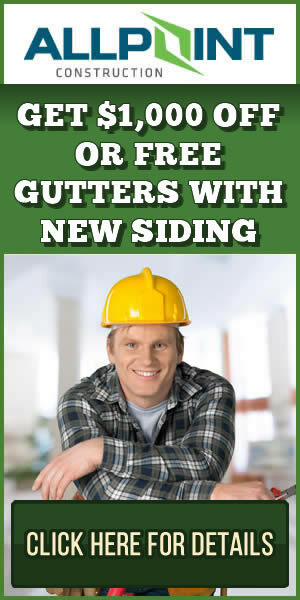 They offer installation services for James Hardie siding and more in the Downriver Michigan area. All Point Construction is a fully licensed and insured home improvement contractor in Downriver Michigan and offers free estimates to help you decide if this is the right fit for you.